Alrighty, the Nosh Show is back again but I have a question first. 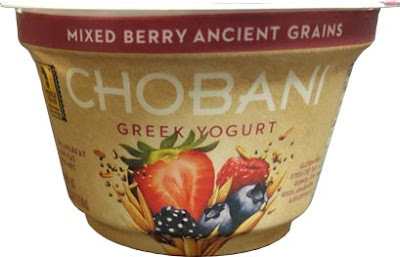 Why does my Chobani Mixed Berry Ancient Grains Greek Yogurt taste like mustard? I'm dead serious. I was kind of curious how these things taste but it is awful. It's like eating the top bun off of a fast food burger, so all you taste is a mix of bread, mustard, ketchup and a little pickle. Am I going even more crazy? Anyway, Episode 71 is live and it was decided that we should do a recap with the best (and sometimes worst) of 2015. I unfortunately lost my show notes so I improvised a bit by recapping the biggest events of the 2015 ice cream season. This includes the (non defunct!) artisan collection from Haagen-Dazs (soon to be replaced by the destination series), Cookie Cores from Ben & Jerry's, and the 8 new flavors from Talenti. My worst of mention goes to the awful Edy's frozen custard which can't leave shelves soon enough. Oh, there was follow up too with talk including the delightful Cinnamon Bun Oreos. Wow, yeah, I can't believe I forced myself to the bottom of this terrible yogurt. bahahahaha, but now you must eat it so that we can either commiserate or tell me I'm crazy! What is this 'destination series' replacing the Artisan collection for HD? So I finally ate mine. You're right does have a slight mustard aftertaste, but what bothered me more is the fact that I felt like i was eating yogurt with gravel thrown in. I guess I'm just not a 'grain in yogurt' kind of person.